The Annual Status of Education Report (ASER) 2012 is out and has already generated discussion on the state of education in the country. A quick survey of some figures seem to point to a mix of a movement forward – especially in terms of infrastructure and broad enrolment ratio – and a certain movement backward in terms of learning skills and teacher performance. It would be perhaps useful to have a brief look at some of the findings and to note with alarm the fact that the principal investigators of the report feel that there is indeed a ‘deepening crisis in education’, especially mass education in the country. And this crisis, they feel, is like ‘an unseen and quiet killer disease’ of which the government, education policy makers and educationists in the country ought to take serious cognisance. Some of these findings may be thus enumerated: learning levels in government schools are declining and the private school enrolment figures are rising by almost 10% per year. A decline in education performance has been discerned as well. This has been attributed by some experts to the RTE regulation which stipulates no detention till class VIII leading to a ‘relaxation’ in teaching in classrooms. It has been argued that the scrapping of all exams till that notified level has contributed to the reduction and eventual removal of performance pressure from the classroom thus leading to a decline in educations standards. One can argue that instead of seeing this as the debilitating effects of adhering, for more than a century, to an exam and syllabus oriented centralised education system, the tendency is to decry any move that looks at trying to reduce the stress and load on the young learner. The teachers for this past period – ever since the colonial system of exam-syllabus oriented education was introduced – gradually lost their sense of initiative and became mere executors of textbooks. Their new found role thus, as educators and not mere examination monitors and facilitators may have left them perplexed for the time being leading to a certain hesitancy which is perhaps mistakenly being perceived as ‘relaxation’. On the teachers’ role, the report observes that the problem with the ‘governmental system is that the individual teacher feels that he has to wait for the highest authority to say what is to be done.’ Therefore it may be asked whether under the no-exam RTE regulation the teachers and their role need a comprehensive re-examinations and rethinking. This particular RTE regulation requires greater study and debate and ought not to be dumped without forethought. The other observation on the deteriorating levels of learning and retention that the report made was that it was better to ‘adhere to a policy of achieving basic learning outcomes’ rather than solely focus on ‘completing the syllabus.’ The past adherence to a mechanical system of education ensured the primacy of the text book and subordinated all other aims of education to the overweening goal of completing the syllabus. It must be recognised that these expressions in our times are a result of that past history. The other point of concern that the report highlights is the widening gap between children who go to government run schools and those who attend private schools. The District Information System of Education (DISE) statistics for 2012 have revealed that 29.8% Indian children in standard I-V, both and urban and rural, attended private schools in 2010-11. Pointing to this growing trend of taking recourse to private education the ASER 2010 report revealed that 22.5% of rural children in standard I-V attended private schools and the ASER 2012 reports that the proportion has risen to 28.39% over two years – an increase of 5.8%. Making a projection, the report notes that in this manner by 2014 41% of all India’s primary age children will be attending private schools and that by 2019 the private sector will emerge as the ‘clear major formal education provider in India.’ Commenting on this trend, the report observes that private school enrolment ‘will go on increasing till it hits family budget constraints’ and ‘unless the quality of government schools improves substantially’ this gap between government school going children and private school going children will ‘create a great divide in every aspect of life and opportunity.’ Taking this further the report also notes that by 2020 over 50% children in India will have to pay for their primary education. On skills developed the report found that in private schools, less than 40% of standard V children ‘could solve a simple division sum in 2012.’ General reading skills continue to be a cause for ‘serious concern’ with more than ‘half of all children in standard V’ being ‘at least three grade levels behind where they should be.’ On the enrolment front it has been noted that 96% of children between the ages of 6-14 years attend school and the other positive development is that of enhanced basic infrastructure in schools. The teacher pupil ratio has shown improvement as well; in 2010 the percentage of schools meeting these norms was 38.9 while 2012 saw it rise to 42.8%. While 73% of schools surveyed had drinking water facilities and the proportion of schools without toilets has seen a reduction from 12.2% in 2011 to 8.4% in 2012 the mid-day meal scheme was also seen in operation in 87.1% schools that were surveyed. But challenges, especially in teaching, teachers’ training and motivation in rural mass education remain. The inability of governments to really revamp primary education, especially rural education, is one of the greatest looming challenges for Indian education in the years ahead. It would also be useful and timely to underline in this brief discussion the fact that India of the not very distant past, India in 1700s – 1800s did possess an extensive rural education network. It was not that the vast rural hinterlands of India were forever educational deserts till the British came and redeemed the situation by introducing the light of education and governance. It would be an interesting study to try and trace the gradual decimation of that network and to see how we have ceased to discuss that rural model of education in India and of how we have stopped deriving any inspiration from their governing principals and framework. There appears to be a systematic effort to discourage any discussion of these and to relegate any memory of them to the realm of myths and legends. In short, our present education discourse hardly takes note of our civilisational and cultural perception of education and of past efforts that went into giving concrete shape to it. In fact it has been amply noted that in a report on the status of Indian education around 1830s British observers recorded the existence of around 1, 00,000 village schools in Bengal and Bihar alone. Obviously it would be unfair to try and fit these indigenous schools into shapes of those that were later institutionalised by the colonial system or of that of schools today. These schools – argue those few experts who have studied the Indian education system from the Indian point of view – were ideally suited to the rural society, were seen as ‘watering holes of the culture of traditional communities’ and were ‘kept alive by revenue contributions by the community including illiterate peasants.’ Interestingly these may be seen today to have been private initiatives, they may well have been, but with a huge difference. The pupil never seemed to pay for his education and sustaining of the educational institution was the responsibility of the community and done through a sense of service and duty. Examples of such an approach and spirit abound in Indian civilisation. For instance, records show that a minister during the reign of the Rashtrakuta King Krishna III (c.939-967 C.E. 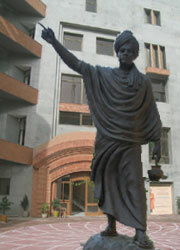 ), established a temple which also accommodated a centre of Sanskrit learning. As the institution expanded it had to build ‘as many as twenty-seven Hostels for residence of its students who hailed from different provinces (nānājanapadodbhavāh).’ The growing expenses were met from endowments. A ‘special endowment of twelve Nivartanas’ (approximately 60 acres of land) met the expense of lighting the hostel while another endowment of ‘500 Nivartanas’ sustained the expenses of boarding of at least 200 students. The principal of the institution, it is recorded, was maintained by ‘another endowment of fifty Nivartanas.’ The village Salotgi, which housed the temple and institution – an ancient centre of learning located in the present day Bijapur district of the southern Indian state of Karnataka – also supported the institution by ‘an arrangement that each villager should contribute to its funds 5 coins at each marriage, 2 ½ coins at each Upanayana.’ It was also stipulated that at ‘every social feast’ the students and teachers were to be invited. Instances such as these, supported by empirical epigraphic records, abound in the story of Indian education. Each is endowed with lands for maintaining masters in every science. When ever, the revenue of these lands, prove too scanty for the support of pandits, and their scholars, the Rajah’s treasury supplies the deficiency for the respective masters have not only stated salaries from the Rajah, for their own support; but also an additional allowance for every pupil they entertain. Their method of teaching is this; - two of the masters commence a dialogue, or disputation on the particular topic they mean to explain. When a student hears anything advanced, or expressed that he does not perfectly understand, he has the privilege of interrogating the master about it. They give the young men every encouragement, to communicate their doubts, by their temper and patience in solving them. The teachers were also bound by a strict code of conduct vis-à-vis the pupils, ‘It is a professed and established maxim of Nuddeah, that a pundit who lost his temper, in explaining any point to a student, let him be ever so dull and void of memory, absolutely forfeits his reputation, and is disgraced.’ Interestingly teachers of these indigenous schools and institutions of learning often ‘encouraged students to learn by giving them small stipends out of their own pockets.’ Thus the organisational and support structure of education, the recognition and encouragement of academic and learning qualities and skills and the approach of the teacher to education and to education imparting – practical, ethical and philosophical – seem to have been evolved to a great and complex level. Empirical evidences also abound into how the indigenous schools were not ‘strictly communal but instead provided some mobility for disadvantaged castes and revealed an underlying harmony in which the major religious groups – Hindus and Muslims – studied with and were taught by teachers of different backgrounds.’ These schools, interestingly, ‘turned out the accountants, the lawyers, doctors, priests, and officials required in the traditional society.’ The centralised colonial system was completely incapable of understanding the needs and the psyche of such a society. It eventually placed in opposition to the demands of such a society its own needs, ‘the desires of missionaries and the interests’ of the urban businessmen. The indigenous system saw subversion and it was such pressures which gradually allowed the ‘vast system of indigenous schools’ to ‘soon wither before the power of the new English curriculum.’ The ‘intimate relationship between schooling and the culture of the people’ that this system signified was disrupted and eventually lost. The content of studies [in India] was better than what was then studied in England. The duration of study was more prolonged. The method of school teaching was superior and it is this very method which is said to have greatly helped the introduction of popular education in England but which had prevailed in India for centuries. School attendance, especially in the districts of the Madras Presidency, even in the decayed state of the period 1822-25, was proportionately far higher than the numbers in all variety of schools in England in 1800. The conditions under which teaching took place in the Indian schools were less dingy and more natural; and, it was observed, the teachers in the Indian schools were generally more dedicated and sober than in the English versions. A sophisticated fiscal arrangement made possible such a vast education network. This ‘sophisticated operative fiscal arrangement of pre-British Indian polity’ had long ensured that a regular flow of revenue sustained a multiplicity of public projects. As Dharampal notes, ‘These seem to have stayed more or less intact through all the previous political turmoils and made such education possible. The collapse of this arrangement through a total centralisation of revenue, as well as politics led to decay in the economy, social life, [and] education.’ In fact the many assumptions of our past education networks, capacity and performance may have to be reviewed in this light. The conundrum of rural education in India thus continues to elude answers and directions. The past of Indian education may hold keys to a partial way forward by helping the formulation of possible models of education – but asking for a detailed and comprehensive study of it to be made in order to generate a wide debate with all concerned stakeholders is perhaps asking too much. Is it at all possible to convince our policymakers that an Indian education past may still provide clues to the present of Indian education, and that too in a wide gamut of areas? Annual Status of Education Report (Rural) 2012, (New Delhi: ASER Centre, 2013). Radha Kumud Mookerjee, Ancient Indian Education (1947), (New Delhi: Motilal Banarsidass, 1969), pp.367-369. Dharampal, ‘British Narrations on India its Conquest Dominance and Destruction 1600-1900 A.D.’, Archival Compilation,vol.9, (Sevagram: Ashram Pratishtan, 2000), p.6. Dharampal, ‘The Beautiful Tree’, Collected Writings, vol.3, (Mapusa: Other India Press, 2000), pp.18, 20, 21. Joseph DiBona edited, One Teacher, One School: The Adam Reports on Indigenous Education in 19th Century India,(New Delhi: Biblia Impex, 1983), pp. x, xi,1, 2.